Bar Stool Delivery - Bar Stool Warehouse - We Manufacture Our Own Bar Stools! We use a combination of third party couriers for delivery such as TNT and Parcelforce for the delivery of our bar stools as well as using our own fleet of Mercedes Sprinter vans with our own drivers and drivers mates. We endeavour to despatch all orders for bar stools that are in stock within 10 business days of payment. If for any reason the delivery timescales are likely to exceed this we will contact you as soon as we are aware of this delay. If this delay is not acceptable to you we will happily refund your order in full prior to despatch. 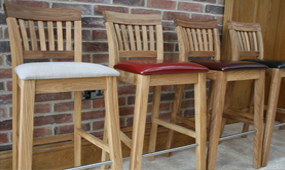 Find Out More About Our ManufacturingWe Have a lifetime in the furniture industry, supplying a top quality bar stools. The majority of the bar stool products offered by Bar Stool Warehouse are designed in house and manufactured by some of the finest furniture manufacturers in the world. Find Out More About Our Customer ServiceWe deliver with our own two team, and place the items where you need them. We pride ourself on quality delivery. Our after service customer service is second to none, we are here to help. See our videos of our stands at the Ideal Home Exibition, and in our stores and warehouses in the UK. View Them Now!Take a look at our set up!